24 total news articles in this section, 10 per page. Giga and Mega combine to form the menacing Overlord! This Generation One character was made even more popular from the Last Stand of the Wreckers, and we've got the most beautiful rendition of the Powermaster to date. Everything from the Generation One Toy seems to be replicated spot-on, from the Gigatank, to the Megajet, and even the little Powermasters. From Seibertron.com member and Procustomizer Sabrina, creating Overlord was a lengthy project, and now we're graced by his presence. A combination of Armada Tidal Wave, ROTF Jetfire, ROTF Bludgeon, and some tender love and care, words can't explain this! But pictures certainly can, and you'll see the custom below! You'll find more pictures in the forums! Share your customs with us, whether they be repaints, remolds, or everything in between in the Transtopia forums! A roundtable discussion with active Transformers Comic readers would likely yield Last Stand of the Wreckers as the best series of 2010. Not only did the series feature fan-favorite characters, but also new additions to the team. They were a handful of obscure Generation One characters, additions that we thought weren't going to make it through the series alive. One of these rookies is Guzzle, a character who hasn't received any love since his small 1988 toy. Customizer frenzy_rumble decided to give the short Guzzle a much needed update From Marvel Crossovers Hulk, check Guzzle out below! Keep it at Seibertron.com - the Ultimate Transformers Resource! Customizer Shinobitron thought it was high time that Slipstream's character was transformed into toy form. Nope, not in her Animated design or her War For Cybertron form, instead she takes her form from the Gundam universe. In Gundam 00, the GN Archer is a mobile armor and is piloted by Marie Parfacy - resulting in the Archer being a very feminine mecha. As you'll be able to tell from the pictures below, it's very fitting! 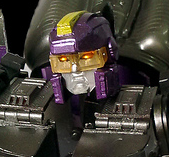 The head is taken from Cybertron Thunderblast. Check it out below! Share all your customs with us in Transtopia! Whether it's Mini-cons, Noisemazes, Energon Insecticons, or anything else in between - army building makes a great showcase in anyone's collection. It shows that the collector is dedicated by buying the same figure over and over again. 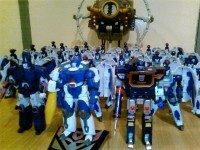 Seibertron.com member nemesis_saber shows us his army building, as he's piled a gargantuan amount of Sweeps to be commanded by Galvatron. If you weren't able to find any Titanium Scourge's on the secondary market recently, then this collection might tell you why. 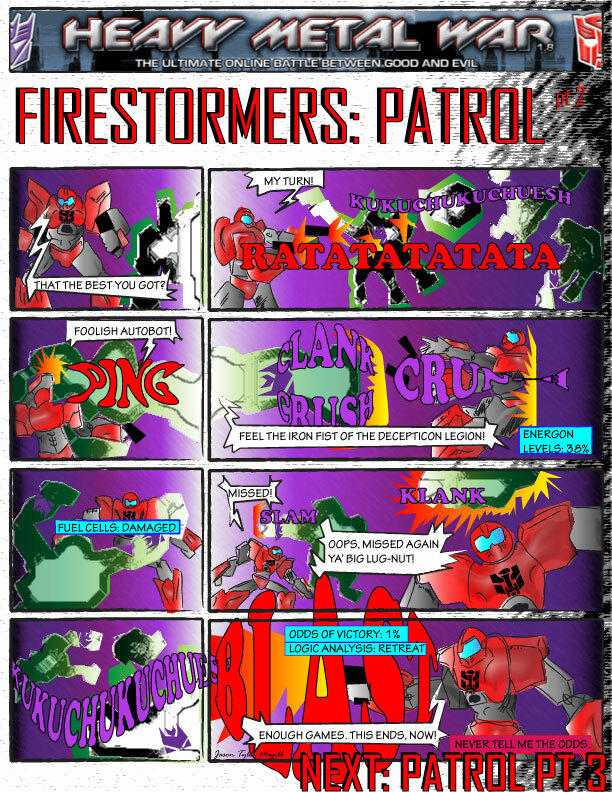 Check out Galvatron, Cyclonus, and the Sweeps below! Make sure to show us your armies in Transtopia! Keep it at Seibertron.com- The Ultimate Transformers Resource! Skywarp and Mirage. Both popular Transformers characters feature comic book-like powers, however Mirage has been the only one to receive toy representations of his 'Invisibility'. 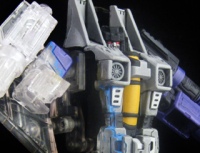 Skywarp fans rejoice, as Seibertron.com member and customizer frenzy_rumble has put Skywarp's Teleportation into our favorite plastic form. Using a special Knock Off Clear Classics Seeker, frenzy_rumble has transformed this no name seeker into a very dynamic Skywarp. All for your viewing pleasure, check out the pictures below! Got Transformers customs, artwork, or anything in between? Share it with us in our Transtopia Forums! If there's something strange in the neighborhood, who you gonna call? Roadbuster! Nothing like a double dose of Transtopia Masterclass action to end the week. If you thought Universe Roadbuster, or perhaps Animated Roadbuster Ultra Magnus were good homages to the Generation One character, prepare to be blown away. This magnificent custom by Seibertron.com member Shinobitron takes an oversized KO Movie Ratchet and puts it to great use. Armed with enough weaponry to take down Trypticon by himself, prepare to drool all over this custom! Remember to post all your Transformers related art in our Transtopia Forums! To customizers, it's not always about making the greatest, or best figure. Sometimes it's all about simply conveying an idea into reality. While many customizers out there have had Masterpiece Astrotrain on the brain - Seibertron.com member wan_de_real has done it again. He's famous for his Masterpiece sized creations, and our favorite Decepticon transport is his latest selection. Not only is the figure massive, but it also won Sector70's Triple Changing Contest! For some eye candy, check out the pictures below! You'll find more pictures in wan_de_real's Photostream. Remember to post your Transformers related customs - whether it be repaints, scratch builds, artworks or stories in our Transtopia forums! We usually like to spice up the variety here in Transtopia, but War For Cybertron is on our minds. Customizer blacklion29 has turned the solid Cybertronian Optimus Prime toy into another masterpiece. You may remember his WFC Nemesis Prime from before, and now he's decided to work his magic on the character of Ultra Magnus. 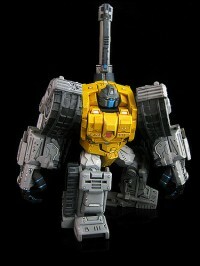 No, not just one figure, but we get a look at two different versions of the stalwart Autobot soldier. The first is what we generally see Ultra Magnus as - powered up in his Commander armor. 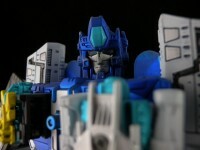 The second is what we've seen Ultra Magnus as in the past few years, a white and blue repaint of Optimus Prime. Feel free to check out each version below! You'll find more pictures in our Transtopia forums! War For Cybertron Ultra Magnus did not appear in the console versions of War For Cybertron (barring his possible release in DLC), but is present in the Nintendo DS version. You can see what he looks like here. On behalf of Cybertron.ca, the staff of Seibertron.com would like to share with everyone a charity auction benefiting SickKids Hospital, based in Toronto. TTT, CybrMnky, Brr-icy, Malwave, Venksta, chansformers, Nemesis Predaking, Cliffjumper69, racerguy76, and encline - all names you've heard of on the customizing scene were able to put together an amazing set of Transformers Animated customs. 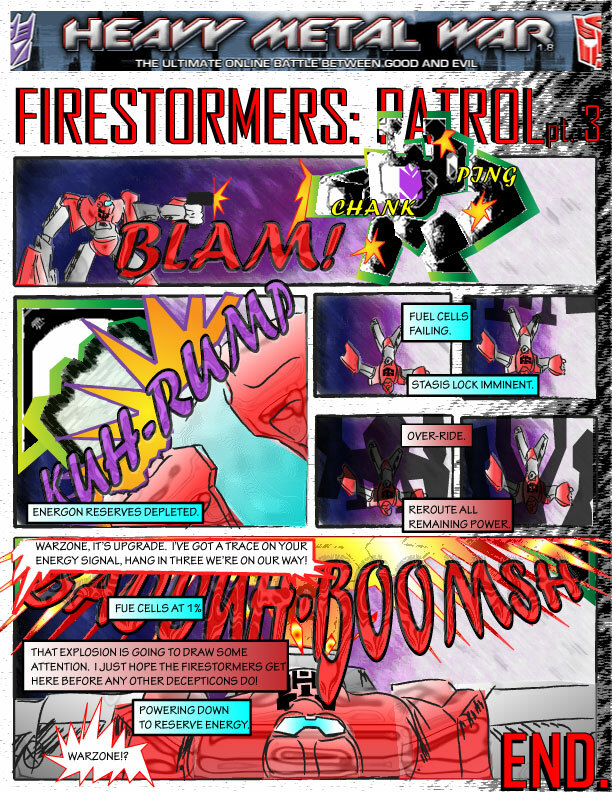 There are two sets benefiting SickKids Hospital, one is the Protectobots, able to combine into the mighty Defensor. 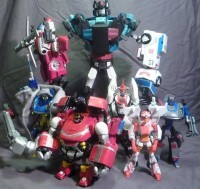 The second part is Emergency Response Team, composed of Red Alert, Nightbeat, Siren, Inferno and Minerva. You'll find the auctions over at Ebay in the links below! Ever since Ryan flicked the switch on Heavy Metal War game, the HMW forums have been graced with many creative players. Some kitbashed, some photoshopped, some simply wrote fics while others drew renditions of their characters. But they all brought their HMW characters to life in some form. Jason Tyler is a relatively new player to the game but he's kept on with the HMW creative tradition. 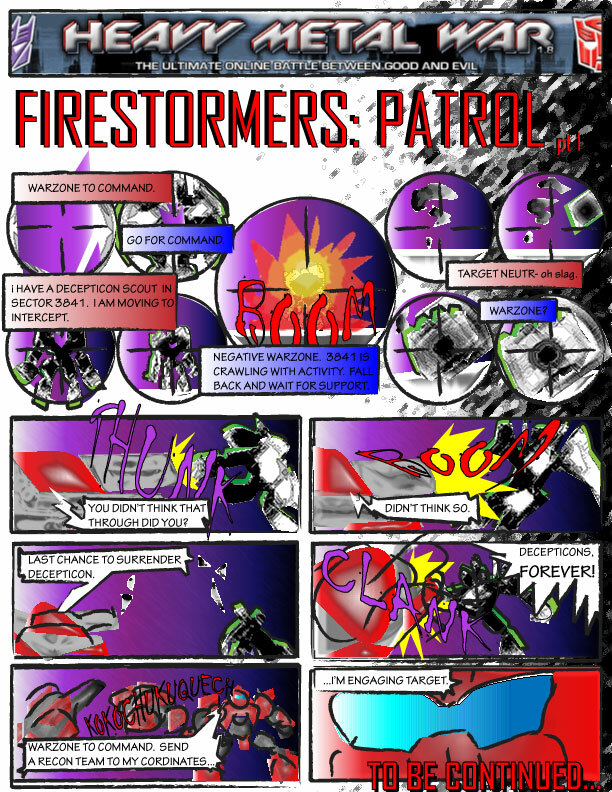 Drawing inspiration from the hugely popular Mosaics and HMW mission logs, Jason has created a short three part series entitled "Firestormers". Anxious for more? Then stay tuned as Jason is working on the "Inferno" series based on the "Inferno" mission texts. 4,562 pages were recently viewed by 457 unique visitors. This page was viewed 1 times on Tuesday, April 23rd 2019 2:54am CDT. © 2019 Seibertron, Inc. DBA Seibertron.com. All Rights Reserved. Established June 2000. Seibertron.com is owned by Ryan Yzquierdo.